The Securities and Exchange Commission reforms removed J. P. Morgan's two directors from the boards of almost every one of the U.S.A.'s great corporationsexcept Henry Ford'swhose interlocking directorships had formerly given Morgan prime control over U.S.A. industry. With the termination of Morgan's control of all the major corporation boards such as those of U.S. Steel and General Motors, these great corporations' managements found that they were no longer beholden to J. P. Morgan, and only to their stockholders. "All we have to do now to hold our jobs is to make money for the stockholders." At this moment the U.S.A. had evolved into a managerial capitalism, in contradistinction to the now-defunct, invisible "finance capitalism" of which J. P. Morgan had been the master. What became noticeable at this time was the uniformity of position taken by all the great corporation managements in respect to actions taken by the New Dealfor instance, the great corporations' across-the-board refusal to expend surplus on research and development. To discover how that came about it first must be realized that the industrial-enterprise underwriting and expansion-financing of the private banking houses of Wall Street could not have been carried on without the advice, contract-writing services, and legal planning of the world's most powerful and most widely informed legal brains. As a consequence the corporation law firms of Wall Street, New York, were peopled with the most astute thinkers and tacticians of Americaif not of the whole world. When the Great Crash of 1929 came and events of the Depression occurred, as already related (and the great poker hands were called, and the New Deal had prosecuted the guilty and housecleaned the system and socialized the prime contractors, etc. ), it was the counsel of Wall Street lawyers that governed the positions taken by the new, self-perpetuating, industrial-giants' managements. It was the former J. P. Morgan's and other financiers' lawyers who now counseled all the as-yet-solvent big-industry managements to guard their surplus and refuse to cooperate with the New Deal. Furthermore the Wall Street lawyers could see clearly what the public couldn't seei.e., that while the New Deal was unilaterally socializing the system, it was doing so without exacting any contractual obligation on the corporations to acknowledge the government's economic recovery strategies. The corporations gave no legal acknowledgment of their socialized status. It was clear to the Wall Street lawyers that without such contractual acknowledgment the government socializing was a one-sided, voluntary commitment on the part of the political party in power. Therefore, in fact, none of the big corporations had lost their free-enterprise independence by accepting the enormous government rehabilitation expenditures. Since the Wall Street lawyers and brethren in other parts of the country were called upon to fill the Supreme Court bench from which body they could determine the province of "free enterprise," the lawyers reasoned somewhat as follows: "A socialized systemas clearly manifest by the U.S.S.R.cannot tolerate free enterprise's freedom of initiative. There is no lucrative law practice in socialized statesergo, if we are to survive, we lawyers on Wall Street had best figure out how to go about keeping the fundamentals of capitalism alive amongst the few great industrial corporations that as yet remain solvent despite the 1929 and 1933 Depression events." The Wall Street lawyers saw clearly that it was those surviving corporations' undistributed surplus which certified that capitalism had not gone entirely bankrupt despite its banking system's failure. Operating invisibly behind the "skirts" of the as-yet-live corporations, the Wall Street lawyers very informally, but very seriously, organized far-ahead-in-time research-and-study teams consisting of the most astute corporation lawyers to be found in America. From these teams' realistic conceptioning they formulated a grand strategy that would keep capitalism's private enterprise alive and prospering indefinitely as run invisibly but absolutely legally by the lawyers. The latter's research discovered that they would not soon be able to popularly and legally overthrow the New Deal. It was clear that not until World War II was over might they find conditions suitable for untying all the economic controls established by the New Deal. It is appropriate at this point to do some reviewing of evolutionary changes that had been transpiring in the nature of capitalism. It all starts with the land-based capitalism, a capitalism maintained by whoever seized, successfully defended, and controlled the landergo, owned the land. Those producing food and life support on the lands were all subservient to, and paid tribute to, the great landowners. In land capitalism whoever owned the fertile fields controlled all the wealth to be made from that land. Land capitalism dealt with nature's own metabolic productivity. Then private enterprise and finance capitalism came to discover what could be done with mass-produced metals to multiply the value of the land-produced, life-support metabolics. In the mid-nineteenth century mass production of steel, for the first time in history, suddenly gave humans the capability of producing long-span beams, whereby they were able to produce large-enough, semifireproof, and powerful structures to move more and more wealth-production work under cover. Western-world capitalism began to produce wealth under cover in addition to that produced out in the field. To make the tin cans in the factory to can the food produced in the fields, or to take the cotton produced in the fields and mass-produce cotton cloth, became known as "value-added-by-manufacture." Value-added-by-manufacturing was accomplished primarily with metalsmetal buildings, metal machinery, metal tools, metal sea and land transportation systems, and, ofttimes, metal end products. As already mentioned, it was the new, world-around, metals sources that brought about the name World War I. Suddenly we had a completely new form of capitalism, which required both the large-scale financing and integration of metals, mines and mine-owners, metals refining and shaping into wholesaleable forms, all to be established around the world by the world masters of the great line of supply. The world line of metals-and-alloy supply was essential in producing all the extraordinarily productive new machinery and that machinery's delivery system, as was the generation and delivery of the unprecedentedly vast amounts of inanimate energy as electricity. This new form of the world power structure's capitalismby ownership of the mines and metals working all around the worldwe call the metals and mining capitalism. Whoever owned the mines had incredible power, but never as great as those who controlled the line of their supply. Combining the two, (1) the mines and metals-producing industry and (2) the line of supply, we have the world power structure that operated as the first supranational, world-around-integrated, metals cartels. They were out of reach of the laws of any one country, in a metals cartels capitalism. Combining these two with (3) the absolute need of the large financing and credit at magnitudes rarely affordable by any one individual, we find finance capitalism integrating the world operation. At any rate we now understand why the 1914-18 war was called World War I. It was inherently a war for mastery of the world's metallic resources and their world-around physical integration, controlling, and exploitation. The amount of metal productivity of World War I was so great that, after the war, as the arms products became obsolete and were displaced by new design products, the metal contained in the ever vaster amounts of obsolete products began to come back into circulation as scrap. The scrap resources swiftly increased. The Morgan-escaped managerial capitalists said, "I'm going to keep my job if we pay our stockholders dividendsthe rate at which we can pay dividends is directly dependent upon the rate at which our production wheels go around. To keep our wheels going around, we don't care whether we are using scrap metals or mined metals. As a matter of fact, the metals-as-scrap are usually more refined than the metals coming out of the mines. They cost less, so we're better off using the scrapwhether from obsolete buildings, machinery, armaments, railways, or ships." Formerly Morgan had insisted on all his controlled manufacturing corporations acquiring all their metal stocks only from newly mined, refined, and wholesale "shaped" stocks. The mining companies found that industry would not buy ingots of their metals. They found that they had to turn their metals into tubes, bars, sheet, plate, wire, and a great variety of sizes and shapes. Wall Street's finance capitalism, therefore, underwrote the development of a host of metals-shaping industries who were the automatic customers of the only-ingot-producing, metals-mining corporations. The post-World War I mineowner-capitalists began gradually to be washed out of the game by virtue of the Morgan-emancipated managerial capitalists saying, "Our job is to keep the wheels going around." Wheels-going-around producing saleable goods from scrap metals became strategic. Up to the time of World War I the owners of the factories (Mr. Morgan et al.) said, "We put you in as management to make a profit out of this factory." If the management said, "Give us a new piece of machinery," the owners said, "New piece of machinery! What are you talking about? We put you in to make money out of our machinery. You are fired." Change was anathema to the J. P. Morgan-type of financier. Scientists would come to Mr. Morgan and say, "Mr. Morgan, I can show you how to make steel so that it won't rust." "Young man! The more it rusts, the more I sell. How crazy you must be! Get the doctor to look this man over, he's obviously a lunatictake those mad papers out of his pocket and put them in my desk drawer." But change was welcomed by the late-1930s' managerial capitalism. New designs called for more whirling of their production wheels. The change came in the form of many new armament designs for the clearly approaching World War II. The new designs released as "scrap" the metals from obsolete designs. Concurrently, with the New Deal's reforms and controls, the wage-earners were now getting a fairer share of the national income, and the economy was prosperingparticularly so as the New Deal began officially to remember the "forgotten man." Congress put a dollar cellar under the wages and elevated worker earnings enough to produce minor affluence and security for labor in general. Just before the U.S.A. entered World War II, the Wall Street lawyers instructed the heads of great corporations to say to Roosevelt, "We heads of the corporations of America were not elected by the American people. We were chosen by our stockholders. Our job is to make profits for our stockholders. At the time of World War I a lot of business people were called 'profiteers.' As we enter into World War II war production, we don't want to be called 'immoral profiteers.' If you want cooperation from us, Mr. Roosevelt, you as government are going to have to be the one to initiate our corporations' being properly rewarded for our cooperation." Mr. Roosevelt said, "I agree. You are beholden to your stockholders, so you are going to have to pay them dividends." Coping with this dilemma, the United States Treasury Department agreed that it was legitimate for the industrial corporations to make up to 12-percent profit per each product turnover. The New Deal said, "We the people, as government, are, however, going to renegotiate with you all the time, continually inspect you, to be sure you are really earning your profits." As a consequence of all the continuous renegotiation by the government, those U.S.A. corporations earned an average of 10 percent on every turnover. This meant that in World War II for every annual war budgetrunning at first at $70 billion per year10 percent, or $7 billion, was earmarked for distribution to the stockholders of the corporations. Complete socialization of the stockholders of the prime U.S.A. corporations was accomplished. Amongst the prime contractors identified by the New Deal were all the leading automobile companies. For example, Chrysler was picked out to produce the war tanks. With their powerful position established with the government, the U.S.A. automobile manufacturers, on being asked to convert all of their productivity to war armaments, agreed amongst themselves to put into storage all of their production tooling and to resume their post-war auto production with the models they were last producing at outset of war. New production tooling would cost them several billions of dollars. They had their Madison Avenue companies grind out advertisements showing the G.I. soldiers saying, "Please keep everything the same at home until I return." Because Germany's, Italy's, and Japan's production equipment was destroyed during World War II, they were free after the war to start using the newest war-advanced technology in both the designing and the production of their automobiles. That was the beginning of the end for the U.S.A.'s prestige as the world's technological leader. The U.S.A. post-World War II cars were inherently seven years passe in contrast to the smaller, faster foreign cars. The "Big Three" American auto producers undertook to manufacture while keeping the foreign cars off the market and while they themselves exploited America's market need for a geographically expanding economy's transportation. In the late 1960s the "Big Three" automobile companies of America found that their distributors were disenchanted with decreasing financial returns and with frequent bankruptcy. To hold their distributors G.M., Ford and Chrysler deliberately manufactured a few of their mechanically well-designed parts with inferior materials that were guaranteed to deteriorate electrolytically or otherwise. The replacement of these parts guaranteed that all the distributors' car buyers would have to return to them for service on a high-frequency basis, at which time the distributor would replace the parts catalogue-priced so high that the distributor was guaranteed a profitable business. This continuing deceit of the customerswe the peoplewas the beginning of the end of the American automobile business and the once-great world esteem for Uncle Sam. U.S.A. discreditation has been brought about without the U.S.A. people's knowledge of the money-maker-world's invisible cheating. Throughout all pre-World War II years employers had maintained that unemployed people were unemployed because they were unqualified for survival, socially expendable. Then World War II saw young people deployed on war tasks all around the world. In view of this loss of labor vast amounts of automation were incorporated in the U.S.A.'s home-front war production. With the war over, the government found the cream of its youth all unemployed, and because of the automation there were no jobs in sight. Because they were the proven "cream of the youth," no one could say they were unemployed because they were unqualified, so the as-yet-operative New Deal created the G.I. Bill, which sent all those young people to prepaid college and university educations. By World War II's end labor was earning so much that, for the first time, it was feeling truly secure, affluent, and successful. Emulating the pattern of the rich, individuals of labor were becoming little capitalists, with many enjoying the realization of their own home and land, with two shiny new post-World War II cars in the garage, their kids going to college, and some savings in the bank. The workers began buying shares in IBM and other superpromising private enterprise companies. The Wall Street lawyers, being astute observers of such matters, realized that this labor affluence had brought about a psychological reorientation of the body politic. People no longer remembered or felt the depression of spirit that was experienced in the Great Depression of social economics following the Great Crash. The Wall Street lawyers' grand strategists saw this as the time for breaking through the New Deal's hold on government, an event which, up to that time, seemed impossible. The lawyers said, "Whoever can get the victorious, supreme-command American general of World War II as their candidate for President will be able to get the presidency." They captured Eisenhower. Eisenhower had no political conviction, one way or the other. His vanity was excited at the idea of becoming president of his country. The Wall Street lawyers explained to Eisenhower the prevailing new psychology of affluence and convinced him that the new affluent majority would elect a Republican. Thus they successfully persuaded him to be a Republican. With the healthy economy the new wage-earner capitalists, with a vested interest in maintaining the status quo, readily voted for Eisenhower on the Republican ticket. Elsenhower's Wall Street lawyer-managers explained to him that he had been able to win the war because of the vision, courage, and ingenuity and the productive power of American free enterprise. They convinced Eisenhower that "the U.S.A. is, in fact, free enterprise." They also convinced him that the Democrats' New Deal was socialism and therefore the inherent enemy of free enterprise. As soon as the Wall Street lawyers had Eisenhower in office in 1952, they instructed him to break loose all the economic controls of the New Deal. They had him cut all price controls, all rent controls, all interest-rate controls; they had him terminate anything that was stymieing the making of big money by big business. For instance, they persuaded Eisenhower to allow the insurance companies to invest their vast funds in common stocks. Before Ike's liberation of the insurance companies they were allowed to put their funds only in "Class A" bonds and similar investments. Cheered by the capitalist-owned sector of the press, his Wall Street lawyer-advisors for a long time had Ike feeling like a great liberator. The Wall Street lawyers' grand strategists put the Wall Street lawyer John Foster Dulles in as Ike's Secretary of State to dictate the American foreign policy of "Soviet containment," and Foster Dulles's Wall Street lawyer brother Allen Dulles was put in as head of a new brand of absolutely invisible, U.S.A.-financed, capitalistic welfare department, the CIA, established ostensibly to cold-war-cope with the secret-agent operations of our enemies. So secret was their operation that the people of the United States and its Congressional lawmakers had no idea of the size of the unlimited funds given to the CIA, nor for what those unknown funds were expended. The CIA and Allen Dulles had a U.S.A.-signed blank check for X amount of money to do X tasks. I call the CIA, "Capitalism's Invisible Army." The great U.S.A. corporations, having been saved in 1933 by being only "unilaterally socialized," and having in the subsequent fifteen years become powerfully healthy from enormous war orders, immediately after Eisenhower's election started escalating prices. Their logic was that the first corporation head to increase prices in a given field of production would be the first to be able to distribute that "upping" as profits to his stockholders and thereby to gain for himself greater economic management status and personal wealth. As a long-time student of foreign investment I saw a pattern developing. Between 1938 and 1940 I was on the editorial staff of Fortune magazine as its science and technology consultant, and my researchers harvested all the statistics for Fortune's tenth-anniversary issue, "U.S.A. and the World." In that issue I uncovered and was able to prove several new socioeconomic factsfor the first time in the history of industrial economics: (1) the economic health of the Americanor any industrialeconomy was no longer disclosed (as in the past) by the total tonnage of its product output, but by the amount of electrical energy generated by that activity; tonnage had ceased to be the criterion because (2) we were doing so much more given work with so much less pounds of materials, ergs of energy, and seconds of time per given function as to occasion ever newer, lighter, and stronger metallic alloys, chemicals, and electronics. Though at that time universally used as the number-one guide to the state of economic health of any world nation, tonnage no longer represented prosperity. The amount of energy being electrically generated and consumed became the most sensitive telltale of economic health. Furthermore, I was able in that issue to study carefully all the foreign investments made in America all the way back to its colonization in the early seventeenth century. The ramifications of my studies in foreign investments in America and elsewhere are wide. An example of my findings included discovery of the swift, post-American Revolution investment in U.S.A. ventures by the British (East India Company-advised) financial world as already mentioned. I found a similar situation to be existent in World War II. As head mechanical engineer of the U.S.A. Board of Economic Warfare I had available to me copies of any so-called intercepts I wanted. Those were transcriptions of censor-listened-to intercontinental telephone conversations, along with letters and cables that were opened by the censor and often deciphered, and so forth. As a student of patents I asked for and received all the intercept information relating to strategic patents held by both our enemies and our own big corporations, and I found the same money was often operative on both sides in World War II. The East India Company, whose flag I have shown to be the origin of ours, was a private enterprise chartered by the British. Quite clearly the East India Company didn't lose the American Revolution. The British government lost the Revolution, and the East India Company swiftly moved large amounts of its capital into U.S. America. With World War II over I began to watch very closely the foreign investments patterning and the strategic metals movements, especially of copper, but those of silver and gold as well. In 1942 America had all the monetary bullion gold in the world in the Kentucky hills. During World War II what was called "the China Bloc"which was the Sung family and others backing Chiang Kai-shekwere able to persuade the American Congress that China had always been corrupt and was eternally corruptible; to completely avoid communism in China Congress should let them have $100 million worth of gold bullion ($2 billion at January 1980 gold pricing) to be taken out of the Kentucky hills. Personally I don't think that gold ever went anywhere near China. I think it went right into the Swiss bank accounts of some clever thieves. But with that much gold out of the Pandora's box of the U.S.A. Kentucky hills vaults, it provided a "gold lever" with which to progressively pry loose more and more gold to be reintroduced into the "lifeblood" of world economic accounting. After World War II, with only the one exception of the $100 million worth of monetary gold bullion of the China Bloc, all the rest of the world's international monetary gold bullion was residing in the Kentucky hills, U.S.A., vaults. All countries outside America had gone off the gold standard. In the course of international monetary negotiating that accompanied the U.S.A.'s post-World War I inadvertent ascendency into being the master economic state, and the U.S.A.'s post-World War II attempts to rehabilitate the leading economies around the world by rehabilitating the economies of its vanquished nations and thereby increasing international trading, the U.S.A. was persuaded to re-establish the gold standard for accounting the international balances of trade. Gold is the super-helicopter of the open world-market-trading stratagems of the makers-of-money-for-self by the legalized manipulation of the money equity of others, all unbeknownst to the initial wealth equity-owning others. In 1934 Roosevelt's New Deal prohibited the further use of gold by U.S.A. citizens or U.S.A. businesses. By 1953 it became apparent that the Wall Street lawyers were moving the major American corporations out of America. Of the 100 largest corporations in America four out of five of their annual investment dollars in new machinery and buildings for 1953 went exclusively into their foreign operations. This four-fifths rate persisted for a score of years. The Wall Street lawyers told Mr. Eisenhower that they didn't like the overaltruistic social viewpoint of the Marshall Plan for helping underdeveloped countries. They liked foreign aid, but not exclusively for the development of underdeveloped countries. The Wall Street lawyers approved of the "foreign aid" wherefore the U.S.A. continued with annual foreign-aid commitments by Congress. The average annual foreign-aid appropriation has been $4 billion (1950 value) per year over the twenty-seven-year period from 1952 to 1979, which amounted to a $100 billion total. Each new year's foreign-aid bill had a rider that said that if American companies were present in the country being aided, the money had to be spent through those American companies. In the foreign countries the corporations and individuals could again deal in gold. Foreign aid paid for all the new factories and machinery of all the American corporations moving out of America. This became a fundamental pattern: first the 100 largest corporations, then the 200 largest corporations followed, then what Fortune calls the 500 largest corporations. Moving out of America could be done readily because a corporation is only a legal entityit is not a human being. It had no physical body to pass through immigration or emigration. You and I cannot move out of America because we are physicalwe need a passport. A corporation does not. So the Wall Street lawyers simply moved their prime corporate operations elsewhere. It was clearly evident that with only 7 percent of the world's population in the U.S.A., and with two cars already in many U.S.A. garages, by far the major portion of further exploitation of the world's peoples' needs and desires would develop outside of the U.S. of America. But the main objective of the Wall Street lawyers was for the corporations to get out from under the tax control of the American government. In 1933 the American people had saved the corporations by subsidizing them; then, twenty years later, the Wall Street lawyers moved them out of America, getting the American people to pay for the move. This allowed the corporations to acquire gold equities while the U.S.A. citizens and small domestic businesses could not do so. Soon after Elsenhower's 1952 election to the presidency, the lawyers reminded him once more that America clearly had won the war only through his brilliant generalship backed up by American free enterprise, and said, "We want you to stop the welfare-state-inclined American government from competing with free enterprise. You must cut out all the navy yards and the arsenals. They compete against the free-enterprise corporations, which are quite capable of doing the same work as the navy yards, but of doing it much more efficiently. You must turn all such production over to private industry, cut out the U.S.A. post office and turn that over to private enterprise, cut out the Federal Deposit Insurance Corporation and turn that over to the insurance industry." Although much of this transfer of production from government to private enterprise control was never completed, Eisenhower goaded on by his lawyers initiated the flow of taxpayer-financed, highly trained personnel and especially their technical know-how to private enterprise. This irreversible trend continues on to the present day, as can be shown by the history of the whole of the atomic energy field. Those acquainted with the story of the atomic bomb development remember the momentous occasion when theoretical fission was discovered in 1939 by Hahn and Stresemann in Germany and secretly communicated by them to American physicists, who checked out their calculations and found them correct and then persuaded Einstein to go to Roosevelt to tell him that this was so and that Hitler's scientists were hot on the trail. Franklin Roosevelt, exercising war powers given him by Congress, in effect instantly appropriated $80 billion for what became known later as the Manhattan Project. Later, that initial $80 billion appropriation was supplemented by an additional $75 billion for a total of $155 billion of the American people's money that went into developing atomic energy. The Wall Street lawyers' grand strategists sent a man named Lewis Strauss to Washington to "join in the World War II effort." Strauss was a partner in the Wall Street banking house of Kuhn, Loeb. He was also a brilliant son-in-law of Adolph Ochs, president of The New York Times. Strauss was made an admiral in gratitude for his forsaking Wall Street to help America win the war. After the war Admiral Strauss was appointed to the Atomic Energy Commission; in 1953 Eisenhower named him commission chairman. Strauss and the Wall Street lawyers persuaded Eisenhower that the Atomic Energy Commission must not be in competition with capitalism and must be turned over to private enterprise. So it was$155 billion worth of it, all of which had been paid for by the American publicbut it consisted of work so secret that only the scientists who were intimate with the work understood it. All that was necessary to correct the situation was to give contracts to private enterprise to carry on the atomic work and to let the government's scientists go to work for the private-enterprise corporations. At this point the Wall Street lawyers and Strauss persuaded Eisenhower that the United States Bureau of Standards' scientists were in competition with private enterprise and must be curbed. Strauss assured Eisenhower that the corporations would take on all the bureau's discarded scientists. What the Wall Street lawyers' grand strategists realized was something momentousto wit . . . that in the new 99.9-percent invisible reality of alloys, chemistry, electronics, and atomics, scientific and technical know-how was everything. Physical land and buildings were of no further interest to capitalism. Metaphysical know-how was the magic wand of the second half of the twentieth-century world power structures. Physical properties were subject to deterioration, taxable, and cumbersome. Advised to do so by their lawyers, capitalism and private enterprise set about after World War II to monopolize all strategic technological know-howi.e., all metaphysical propertiesand to dump all physical properties. They called for an economic program by which people would be forced to buy the apartments and housesto get all physical properties off capitalism's hands. The post-Eisenhower era becomes most suitably identified as that of lawyer capitalism and of "no-risk," sure-thing, free enterprise. The whole of atomic development was know-how. Scientists had the know-how, and anybody without their technical information could not even speak their language. The Know-How Club, monopolized by lawyer capitalism, was a very tight club. Furthermore, the nonmember four billion plus human beings on planet Earth knew nothing about the invisible micro-macro, non-sensorially-tune-in-able reality. Large private enterprise had now hired all the know-how scientists and engineers. They seemingly could keep the public out of their affairs forever. The world power structure had the U.S. government completely emasculate the Bureau of Standards. There was an earnest and concerned battle by a few responsible scientists to keep the bureau intact, but they were overwhelmed. Henceforth all science must be done by the private corporations themselves or under their subsidized university-college and private laboratory work. To appreciate the extent of this know-how monopoly of the big corporations, one need only look over the wording of the scientist and engineering help-wanted advertisements of the big corporations in the many pages of The New York Times Sunday business section or of their counterpart publications in other big cities. In the invisible, esoteric world of today's science there is no way for the American government or public, without the U.S.A. Bureau of Standards' scientists, to follow the closely held technical secrets of the big, profit-oriented corporations. To a small extent such popular journals as Scientific American help people follow details of this-and-that special case science without learning of the significance of the information in respect to comprehensive socioeconomic evolution. No economic accounting books list metaphysical assets. Metaphysics is held to be insubstantialmeaning in Latin "nothing on which to stand." Patents can be granted only for special casesi.e., limited physical-practice applications of abstract generalized principles, which principles alone are inherently metaphysical and unpatentable, being only "discovered" and not "invented." But physical patents are capital. We have two fundamental realities in our Universethe physical and the metaphysical. Physicists identify all physical phenomena as the exclusive manifest of energy: energy associative as matter or disassociative as electro-magnetic behavior, radiation. Both of these energy states are reconvertible one into the other. Because there is no experimental evidence of energy being either created or lost, world scientist-philosophers now concede it to be in evidence that Universe is eternally regenerative. The physicists have found that energy will always articulate levers electromagnetically, gravitationally, chemically by reactive forces, by vibratory waves, etc. Metaphysics consists only of weightless, dimensionless, abstract thoughts and mathematical principles that cannot lever physical needles in respect to instrument dials. Energy in either of its states, being physical, can be entered into the capital account ledgers. The large issue today is the technical know-how that governs the transformations of energy between its two states. "Know-how" is metaphysics. Metaphysics now rules. When the head of one of the U.S.A. 's largest banks was asked what "commodities" were involved in that bank's import-export dealings with the rest of the world on behalf of the Chinese government, he answered that know-how was the prime commodity being acquired by the Chinese through that bank. I have spent a great deal of time since World War II in Japan, dealing with their industrialists, and have personally witnessed the Japanese acquisition by contracts of a whole complex of exquisitely specific packages of industrial know-how, together with the respective follow-through educational servicesall acquired from, and performed by, engineering and business-administration teams of many of the leading American corporations. The post-World War II Japanese had already perceived that they did not need to own the physical mines of metallic ores because they had learned also how to carry on exclusively with the melting down and recirculating of the world's metals, particularly those poured into the Orient and Western Pacific islands by the U.S.A. during World War II in the form of now-obsoleteergo, "scrapped"armaments. The essence of Japan's recent decades' economic success has been the acquisition and realization of the industrial-technology-know-how wealth existent exclusively in metaphysical know-how, in contradistinction to strictly physical land properties, tools, and end products. With all their pre-World War II machinery smashed the Japanese and Germans acquired new, vastly improved industrial equipment with which to realize their know-how production, whereas the World-War-II-winning U.S.A. and European Allies using their old technology became more preoccupied with making money than in producing superior products. Because of the foregoing it was now possible to maintain that hidden know-how capability within private corporate walls. Since 99 percent of humanity does not as yet understand science's mathematical language, less than 1 percent of humanity is scientifically literateergo, the lawyers' strategy of tight monopolization of scientific know-how within the scientifically staffed corporations was highly feasible. In 1929, at the time of the Great Wall Street Crash, only about 1 percent of the U.S.A.'s big corporations had research departments. Now, half a century later, all the big corporations have all the powerful research departments, other than those in which pure scientists are engaged in academic work under some corporate or government subsidy. Through the national defense budget's armaments development, all the once risky research and development costs of enterprise are paid for by the public through taxation. The big oil companies knew long ago that humanity would ultimately run out of an adequate supply of petroleum and other fossil fuels, though coal may last a thousand years. That's why, by the means we have reviewed, the oil companies acquired control of the know-how on atomic energy as well as all the atomic plants and equipment paid for originally by the U.S.A. government. The power structure's only interest is in selling energyand only energy that they can run through a meter. They're not in the least interested in anyone getting windpowerexcept themselves. Very rich men love having their sailing yachts wind-driven to Europe or the South Seas, but this is not for the people. People's power must be piped or wired to them only through meters. 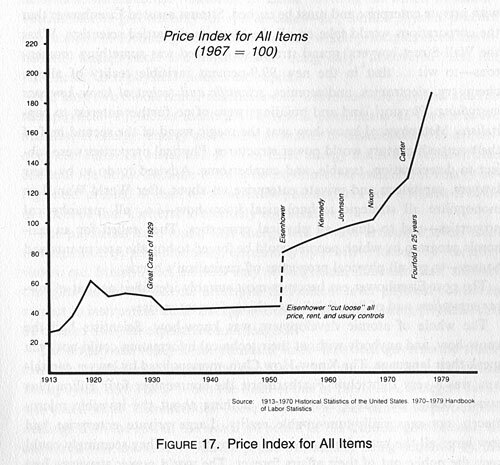 When in 1972 all the power-structure capital had converted its dollars into gold, oil, or other highly concentrated and mobile equities, then-President Richard Nixon severed the U.S.A. dollar from its government-guaranteed gold equity value of $35 per ounce, the U.S.A. people's dollar buying power plummetednow, in 1980, being worth only 5 cents of the 1971 U.S.A. dollar. By 1974 much of the world's buying power landed in the lap of the Arabs, who also sat atop the chief petroleum source of the world. In effect they had both the money with which to buy their petroleum and the largest reserves to be bought. If someone wanted to buy their petroleum, often they couldn't do so, because few in the world had the monetary resources remaining with which to do so. The Arabs realized they would have to lend out their money to work, but they had no experience in such investment matters. The Arabs had no knowledge of the vast industrial production and distribution technical and administrative requirements. Nor had they any experience in the exploitation of the world-energy industry prior to their own lands' exploitation by others before the onslaught of the petroleum company giants. The Arabs had not known how to discover, drill for, refine, and distribute the petroleum upon which they had been sitting unwittingly for thousands of years. So content were the Arab monarchs with the gratification of their every physical desireartfully heaped upon them personally by the capitalist world's foreign-oil-exploiting functionariesthat they would never have taken over the direct mastery of their petroleum affairs had not the psycho-guerilla warfare between the capitalist and communist powers deliberately aroused the Arabian peoples themselves, bringing pressure upon their leaders to take over the foreigners' operations. Since their subsequent epochal enrichment, the Arabs' political leaders as well as the monarchs and sheiks have bought everything of which they could dream, as stimulated by the affluent acquisitions patterns in other economies. After vast stock and bond investments, real estate and new building ventures in foreign countries, they found that they could expend only a fraction of their monetary wealth. The Arabs have now reached the dilemma of how to turn their monetary gold fortune to important and lasting advantage. In 1977 the king of Saudi Arabia said to a leading American banker with large oil interests, "My banks don't know anything about international banking and major industrial accommodation." The American banker said, "Would you like me to run your banks?" The king said, "Of course." So the American banker did, and in the process he taught them international and transnational industrial-finance management. There's no question that the few who have title to Arabian oil find it essential to amalgamate their operations with the world's great oil companies, which own the vast equipment of world-around distribution and interaccounting capabilities as well as the vast majority of refineries and petrochemical industries. The great oil companies control it all. In general they and noncommunist Arabia are one and the same. The Organization of Petroleum Exporting Countries' (OPEC) officialdom, regardless of national political differences, is very probably run entirely by the oil corporations' trillions of dollars of persuasiveness. It is relevant at this point to note that the Arabs' inadvertent isolation of both the physical-wealth items(1) the underlying monetary gold and (2) the prime negotiable energy commodity, petroleumand their concurrent discovery of their utter lack of know-how, clearly differentiated out the relative values of (A) the purely physical petroleum and gold, and (B) the exclusively metaphysical know-how wealth. It turned out that B was most in demand as well as scarcest. The physical wealth was thus proved to be of approximately zero value, while the metaphysical know-how wealth proved to be the prime economic "good-health" constituent of wealth. Moreover, those who own oil also own the atomic energy and have long ago assumed that, if humanity exhausts or abandons oil, it will automatically switch over to atomic energy. Humanity has had nothing to say about all this because the know-how was so obscure and the lawyers' stratagems so invisibly large. The lawyers' omnilegal international stratagems were and as yet are so obscure, in fact, that no government authoritieslet alone the publicknew that the world energy monopoly's scientists had not taken into account earthquakes, for instance, in the construction of New England atomic energy plants, nor had the public or government anticipated that the intuitive wisdom of humanity would develop such an antipathy to atomic energy as eventually to force lawyer capitalism to fall back on its "ownable" coal mines and shale for conversion into pipable and meterable liquid fuels. It is as yet inscrutable to the public, government, and lawyer capitalism just how strong literate humanity's intuitive wisdom will be in preventing the full-scale conversion of coal and shale into liquid energy fuel when it learns, as it has now been learned in a scientifically undeniable way, that this selfishly exploitable energy fuel strategy will inexorably destroy the atmosphere's capability of supporting biological life on planet Earth. Like all fossil fuels coal gives off carbon dioxide when burned, but coal gives off 25 percent more of it per unit of energy than oil and 50 percent more than natural gas. Although carbon dioxide comprises less than 1 percent of the Earth's atmospheric gases, this concentration has risen 17 percent since preindustrial times and is expected to rise an equivalent amount in the next twenty years. The "greenhouse" effect from the Sun's heat and increasing amounts of this otherwise harmless gas could send average global temperatures soaring by as much as 6 degrees Fahrenheit within fifty years according to a U.S. government study. This unprecedented global environmental catastrophe would be virtually irreversible for centuries. No one knows whether the cessation of the waste radiation of atomic energy exploitation or the cessation of coal and shale conversion into fluid fuel will occur in time to permit the physical continuance of humans on planet Earth. What we do know however, as we have previously stated, is (1) that, with the unselfish use of technology, it is now possible to take care of all humanity at a higher standard of living than any have ever experienced and do so on a sustaining basis by employing only our daily energy income from Sun and gravity and (2) that we can do so in time to permit the healthy continuance of humans on planet Earth. Now things are beginning to go wrong with atomic-power generation . . . everywhere. To start off with, neither the scientists nor the atomic plant private-enterprise owners have any safe solution for what to do with radioactive atomic wastes. Humanity's intuitions are logically aroused, and public antipathy to atomic energy is rapidly expandingdespite billions of dollars being spent by the world energy cartel in propaganda campaigns to make the vast majority of people "go for" atomic energy. The second great gasoline-line "pinch" of June 1979 was put upon the public by the invisible energy-know-how cartel to painfully divert the public concern generated by the Three Mile Island radiation accident and threat of a reactor "meltdown." Though the public had reacted strongly against atomic plants, the sudden energy supply squeeze administered by the oil companies made the general public so energy hungry again that it stopped, for the moment, listening to those who were attempting to curtail atomic energy plants. The "gas crisis" re-established "rational" public yielding to governmental support of atomic energy as the "answer" to the energy crisis. Today's (1980) world-power-structures struggle is one between the U.S.S.R. and big capitalism, which we now call lawyer capitalism, which deliberately took the world's private-enterprise corporations out of the fundamental jurisdiction of America. They have kept their U.S.A. operations going in a seemingly normal way, so people in U.S. America haven't realized that these companies are officially situated elsewhere despite the incredible amplification of those great corporations' annual profits, whose annual totals payable to these corporations' stockholders are of the same magnitude as the annual increase in the U.S.A.'s joint internal and external debt increases. America is utterly bankrupt externally in terms of balance of trade due to its own oil companies now operating as Arabian business. The national debt at the time of the New Deal was $33 billionwhich was the cost of World War I. 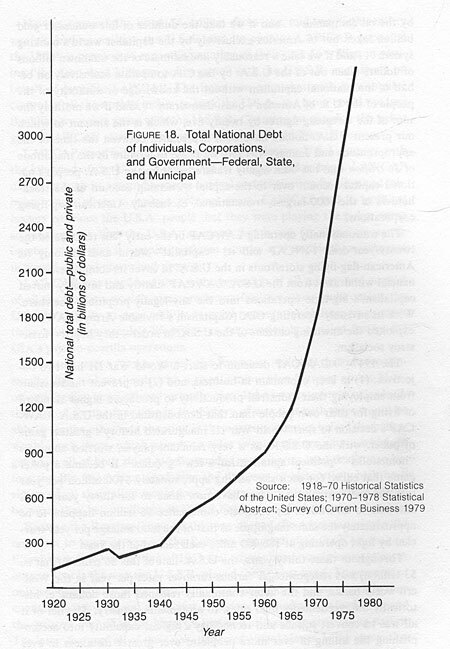 Before World War I we frequently had no national debt whatever. We have today a national debt that exceeds $800 billion30 percent of that indebtedness came from underwriting of ever-longer-term mortgages. In 1934 the U.S.A. underwrote a completely obsolete building industry while Eisenhower allowed the banking world to make an incredible amount of money in interest rates and services* in support of the building and real estate game, which building industryif it were any goodwould pay the U.S.A. back handsomely. The U.S.A. cannot even pay the annual interest on its $800 billion national debt. That is why the Nixon presidency and all those since have had to enter each year with a negative budget, acknowledging that at year's end the U.S.A. will be a $100 billion-magnitude unrecoverably deeper in debt. Our foreign-trade-balance indebtedness is (as of September 1979) $104 billion ($86 billion if foreign branches of U.S. banks are taken into account). Sum-totally, what has been taken from the people of the U.S.A. runs into many trillions of dollars. In the quarter of a century since Eisenhower America has become completely bankrupt, with its world leadership, its financial credit, and its reputation for courage, vision, and human leadership gone. *In 1978 over $1 billion just for transferring home-ownership deeds. None of this was the American people's doing. It was all done in an absolutely legal but utterly invisible manner by the lawyer-capitalism. Individual bankers, industrial-corporation officers, et al. have had to do what their lawyers told them to do. No bad people have been involved. The lawyers were following their survival instinctand doing so completely legally. Everything we have reported here has been published at one time or another, but with the individual items often so far apart from the last relevant item that the public has tended not to remember and associate the items. As a consequence the total picture presented here is approximately unknown to any but the Wall Street lawyers' grand strategists, most of whom are no longer alive. One of my earliest books was Nine Chains to the Moon, written in 1935 and published by Lippincott in July 1938, and now being published by Doubleday. In it I referred so frequently to Finance Capitalism that I developed a contraction of those two words into FINCAP. FINCAP had died a lingering death between 1929 and 1934. In this book, Critical Path, I refer so often to the lawyer-resurrected "capitalism" that it is appropriate to refer henceforth to LAWCAP. LAWCAP's "capitalism" is paradoxically the most highly socialized organization in all historythe citizens of LAWCAP'S welfare-statethe whole body of corporate stockholdershaving an annual average dole of $100,000 per capita without their even having to make a pretense of getting a job. If we take the billions of dollars given in the 1930s to the great U.S.A. defense-industries corporations by the New Deal's Reconstruction Finance Corporation . . . if we take the hidden tax-deduction subsidies to do research, development, and advertising given to all these companies in pre-1942 dollars between 1933 and 1980 . . . if we take the $100 billion in foreign aid that paid for the overseas establishment of the great corporations . . . if we take the $155 billion of atomic know-how and development taken over by the oil companies . . . and if we take the number of fine ounces of gold bullion taken out of America exclusively by the capitalist world's banking system . . . and if we take a reasonably low estimate of the unknown billions of dollars taken out of the U.S.A. by the CIA to operate exclusively on behalf of international capitalism without the knowledge or authority of the people of the U.S. of America's quasi-democracy . . . and if we multiply the sum of the foregoing figures by twenty-five, which is the amount to which our present U.S.A. dollars have been depreciated between the time of the appropriations and January 1, 1980, we come to a figure in the magnitude of $6 trillion that has been legally transferred from the U.S.A. people's national capital account over to the capital ownership account of the stockholders of the 1000 largest, transnational, exclusively American-flag-flying corporations. The transnationally operating LAWCAP in the early '50s resurrected the twenty-year-dead FINCAP and its "capitalist" world and left only its American-flag-flying storefronts in the U.S.A. to cover its comprehensive financial withdrawal from the U.S.A. LAWCAP silently and invisibly moved capitalism's big-time operations into the any-legally-propitious-elsewhere. With its invisibly operating CIA (Capitalism's Invisible Army) LAWCAP exploited the unwitting citizens of the U.S.A. in orderthey hopedto destroy socialism. The 1947-50 LAWCAP decision to start a World War III had two objectives: (1) to keep capitalism in business, and (2) to prevent the Russians from employing their industrial productivity to produce a higher standard of living for their own people than that demonstrated in the U.S.A. LAWCAP'S decision to start World War III inaugurated history's greatest game of poker, with the U.S.S.R. as a very reluctant player, worried about its "home-folks' " political agitation for a few "goodies." It became a poker game that called for each side adding approximately $100 billion per year into the "killingry kitty." They have now done so for thirty years. This amounts to $6 trillion. By complete coincidence $6 trillion happens to be approximately the same magnitude as that of the total mileage per year traveled by light operating at 186,000 miles each second of the year. Throughout those thirty years, the U.S.A.-half of this $6 trillion (that is, $3 trillion) was redeposited at various turnover rates per year in the Western-world banks, and the latter continually reloaned those dollars, at historically unprecedentedly high rates, to armaments industry. The net of it all was to convert science and technology's highest capability into accomplishing the killing of ever more people at ever greater distances in ever shorter time. LAWCAP's comprehensive grand strategy had its Achilles' heel. Having successfully lifted $6 trillion from the mid-twentieth-century world's leading nationthe U.S.A. and its peopleLAWCAP puppeted the U.S.A.'s people into expending another of their own $6 trillion in playing "the drop-dead killingry poker game" with the U.S.S.R. exclusively on behalf of invisible LAWCAP. The latter was sure that with its complete control of all the world's money to back the U.S.A., the latter could not lose the killingry poker game with the U.S.S.R. Counting on winning the poker game, LAWCAP started planning its own post-World War III future. LAWCAP once more deceived its so-easy-to-deceive U.S.A. puppet with the kibitzing of the U.S.A.'s playing of its killingry poker hand. LAWCAP did so through its enormous media control and its election-funding and lobbying power of the American political game. LAWCAP had its political leaders convince the U.S.A. people that they were playing the poker game so satisfactorily that the U.S.A. assumed that it was far ahead in atomic bombs, which gave it complete national security and assumedly maintained its world-around power and prestige. LAWCAP was confident that with ownership of all money and control of all the Western world's arms-producing facilities, they could outlast the U.S.S.R.'s ability to cope with its internal pressure for shifting its productivity toward its people's life-styleas surreptitiously agitated for by the ClA's psycho-guerilla operations. Because it was a "poker game" the Russians, realizing that intercontinentally delivered warheads with a twenty-minute lag between rocket blast-off and landing bang-off inadvertently provided a twenty-minute radar lead, that meant for the first time in the history of war that both sides would be able to see the other side shooting at them twenty minutes before the bullets would reach them, which gave both sides twenty minutes within which to get away all of both sides' atomic bombs, gases, germs, and death rays before the Big Bang, thus producing the first war in history in which both sides and all their allies would lose. To be a survivor of such a war would be worse than being killed by it. Planet Earth would be humanly untenable. Because the Russians knew all this was so, and the American people did not seem to know it was so, the Russians assumed after the Khrushchev-Eisenhower Geneva Meeting of 1955 that atomic bomb warfare would never occurthat is the way the U.S.S.R. played their poker hand. They assumed only enough atomic bomb-making to camouflage their strategy, while they counted on conventional arms, vast divisions of armed and trained men, and the greatest ever of world history's line-of-world-supply-controlling navies. The latter featured all of their now-perfected Vertol planes, being above-the-sea-surface-emitted, vertically ascending into the sky from enormous-bellied atomic submarines, moving far more swiftly submergedseventy knotsthan could the surface-battling, forty- to fifty-knot aircraft carriers. This the U.S.S.R. assessed to be the world-winning strategy. The reason that LAWCAP's strategy kibitzed its U.S.A. players into holding four atomic bomb "aces" and an aircraft carrier "king" was because LAWCAP wanted to be sure that the atomic energy technology was so advanced and proliferated by World War III's end that they could employ its U.S.A.-peoples-paid-for basic equipment and widely developed uranium mines and production sources and its scientific personnel to produce the energy to run through their money-making meters after their fossil fuels were exhausted. LAWCAP's cupidity outwitted its wisdom. LAWCAP's sense of evolutionary-event acceleration was faulty. They bluffed only the people of the U.S.A.not the Russians. The Russians have now attained so commanding a lead in the killingry poker game that even the U.S.A. president concedes that it would take the U.S.A. a minimum of ten years to restrategy itself so that it could in any way cope with the Russians' "conventional" naval supremacy and its vastly greater numbers of modernly armed divisions of world-around warfaring capabilities. In the meantime as already mentioned the United States has gone completely bankrupt internally, its national indebtedness coming very close to a trillion dollars and its balance of trade debt to $109 billionworsening at a horrendous rate due to LAWCAP's arranging to force the U.S.A. to obtain almost half its petroleum energy from the Near East. The U.S.A. has for eight years past been unable to meet even the interest on its internal debt as demonstrated by a negative balance of trade. Its future credit has been hypothecated thirty years beyond Armageddon. Nothing to stop the U.S. Treasury from issuing 2050 notes, but for how far into the future can LAWCAP keep selling U.S.A. promissory notes? Unless God has something else in mind, it looks as though it will not be long before LAWCAP's kibitzing of the U.S.A. will have lost the $6-trillion killingry poker game. Russia will not hesitate to "call" the U.S.A. hand and rake in the winnings of omniworld, line-of-supply controlmaritime, aeronautical, and astronautical. In one way the U.S.A. and U.S.S.R. citizens are in much the same socioeconomic position. The Communist party which runs the U.S.S.R. consists of about 1 percent of their total population, while the U.S.A. is controlled by about the same 1 percent, who are the LAWCAP strategists of the great U.S.A. corporations. The U.S.A. is not run by its would-be "democratic" government. All the latter can do is try to adjust to the initiatives already taken by LAWCAP's great corporations. Nothing could be more pathetic than the role that has to be played by the President of the United States, whose power is approximately zero. Nevertheless, the news media and most over-thirty-years-of-age U.S.A. citizens carry on as if the president had supreme power. All that he and the Congress can do is adjust to what the "free-enterprise system" has already done. They are riding on the snapping end of the power-structure dragon's tail. If I had not been studying and working for a half-century on the assumption that this present state of affairs would come about at about this moment in history, I would have to be very pessimistic now about the human affairs of the 7 percent of the world's population situated within the national boundaries of the U.S.A. let alone critically threatened omnihumanity. But, in fact, I have been studying and working anticipatorily throughout all those intervening fifty-three years, and I know what I am talking about. The world now has an option to become comprehensively and sustainingly successfulfor alland that is what this book is about: How to do so . . . and do so expeditiously enough to succeed within the time limit. "How to do so" is implicit in the chapters that follow starting with the manner in which I came to discover the critical options and the individual self-disciplines that came naturally to disclose the grand strategy of human survival and successful functioning. Only cosmic costing accounts for the entirely interdependent electro-chemical and ecological relationships of Earth's biological evolution and cosmic intertransformative regeneration in general. Cosmic costing accounts as well for the parts played gravitationally and radiationally in the totality within which our minuscule planet Earth and its minuscule star the Sun are interfunctionally secreted. Cosmic costing makes utterly ludicrous the selfish and fearfully contrived "wealth" games being reverentially played by humanity aboard Earth. Fortunately, the Sun does not demand payment for all the energy that it delivers by radiation to Earth in the overall cosmic scheme, which is trying to make humanity a success despite our overwhelming ignorance and fear. The stars are trying to tell humanity to awake and prosper and to consciously assume the important cosmic responsibilities for which it was designed. Since realization and fulfillment of that responsibility involve evolutionary discovery by humanity of the cosmic stature of its mind and the inconsequentiality of its muscle, the planting of humans on Earth may not bear fruit. When Universe is developing important functional interdependencies, she does not put all her embryos in the same proverbial "basket," (or fiscus). So poor is the probability of self-discovery by humans of the infinite potential of the mind and the relative triviality of human musclepower (which is not even as capable as a grasshopper's) great nature must have planted a myriad of human-function-equivalent seedlings on a myriad of planets. In order to succeed as local-in-Universe critical information-gatherers and local-in-Universe problem-solvers in support of the integrity of eternally regenerative scenario Universe, the human-function equipment for local-in-Universe information-gathering will be as variable as the varied environments in Universe. Rarely will they have the appearance of human organismssuch would be employed only under environmental conditions similar to those of planet Earth. The first manifestation that humanity may make good on this planet will be the serious introduction of cosmic costing into the mainstream deliberations of Earthians. Cosmic accounting completely eliminates the economic validity of bankruptcy accounting, except when humans make the mistake of trying to hoard or withdraw critical "capital" assets from production functioning. Withdrawal of capital assets is akin to attempting to withdraw one of the stars from the celestial system. Into what Universe, other than the cosmic totality, may the star be transferred? Every atom and electron is an essential part of the eternally regenerativeergo, totally inexhaustible (but always locally ebbing and flooding)pulsative Universe. For several years I was a member of the "Dartmouth Conference." This was an arrangement made by Norman Cousins and two other Americans with the Russian Academy of Sciences to produce teams of U.S.S.R. and U.S.A. leaders in various fieldsteams of approximately twenty-five on each sideto meet in such years as seemed expedient, first in the U.S.A. at Dartmouth College and next at Moscow-and-Leningrad, next at the Westchester Country Club in New York, etc. I was a member of the Moscow-Leningrad and Westchester, New York, conferences. The conferees discussed every known point of contention existing between the two countries. The U.S.A. team on which I served consisted of John Kenneth Galbraith, Harvard economist; Paul Dudley White, Eisenhower's cardiologist; Norton Simon, financier; Leslie Paffrath, the director of the Johnson Foundation; two Harvard U.S.S.R.-specializing professors; a U.S. Navy admiral and a U.S. Army general. The latter four had been on many U.S.S.R./U.S.A. arms-problem negotiating teams. The balance of the U.S.A. team consisted of Norman Cousins (team leader); Dr. Franklin Murphy, the chancellor of UCLA, now chairman of the board of the Los Angeles Times-Mirror Corporation; David Rockefeller; and myself. The Russian team included the president of their Academy of Sciences, their leading astronomer (who was in charge of their space-vehicle guidance), their leading climatologist, others of their leading scientists, their most eminent writers, philosophers, economists, an admiral, a generalthirty in all. Present also were a dozen "simultaneous interpreters" loaned by the UN. We all lived at the same hotel. The dining room had only four-place tables. As you entered, you chose quickly with which of the Russians you wished to sit. They were the first to reach the dining room. You tried to sit successively with each of the U.S.S.R. team members. The moment you sat down with a Russian, an interpreter moved in with you. To our U.S.A. surprise it turned out at the end of the conference that all the Russians could speak English, while amongst the U.S.A. representatives only the two Harvard professors could speak Russian. Our meetings consisted of: (A) those lasting all day, every day, at which all the officially-to-be-considered points were discussed; and (B) the very small individual dining room and other casual meetings at dinner parties and receptions. At the latter it seemed as though all points of contention could be coped with in a manner satisfactory to both sides. At the formal all-day meetings, however, everyone seemed so intractable that nothing could be resolved. For the last day of the first week-long conferences, some in Moscow, some in Leningrad, it was decided by the leaders of the two teams that instead of having summaries prepared of what had occurred, each side would select one of its members to give a speculative half-day-long prognostication regarding all prominent features of human life on planet Earth for the next half-century. Each prognosticator would have half a day in which to make his or her presentation. It was assumed that the prognosticators would indicate how much each side was accommodating the other side's conference issues. These presentations were expected to provide a clue as to what extent the respective sides would be yielding in the future to the opposing arguments presented during the previous formal sessions. The Russians chose their leading meteorologist to give the U.S.S.R prognostication. He would have all of Saturday morning to present it. I was chosen to present the U.S.A. prognostication. I had all Saturday afternoon to do so. In preparation I made a tensegrity sphere to demonstrate new human-use potentials of nature's fundamental structuring principles of discontinuous-compression-and-continuous as employed in all geodesics and synergetics. I also calculated the weight of a great cathedral we passed each day on the walk to the grand palace in which we held our conferences. Employing tensegrity principles, I was able to show a 99-percent weight reduction for enclosing an equal amount of clear-span to that of the cathedral, including adequately engineered snow-loading, wind-loading, and earthquake-proofing. I based my presentation on the twentieth century's unprecedented invisible revolution in chemistry, electronics, and metallurgy, by means of which we could now do so much more with so much less weight, volume, energy, and time per each accomplished function as to suggest that we humans would soon prove invalid Malthus's seemingly infallible scientific conclusion that economically on our planet Earth it had to be "only you or menot enough for both." I then outlined the changes in patterning of life on Earth if there were ample high standard of living, life support for all. My discourse, its predictions, and the raisons d'etres for those predictions were approximately the same as those of this bookCritical Path. What I said pleased both the U.S.A. and U.S.S.R. delegates. On the walk home to our hotel each individual delegate from both sides hustled up beside me and told me how excitedly pleased he or she was over my statements. The Russians were unanimously enthusiastic about what I said. Fortunately, all the U.S.A. delegates seemed equally pleased. At the farewell banquet that night the president of the U.S.S.R. Academy of Sciences said in his closing speech, "From now on Buckminster Fuller will be ranked in the U.S.S.R. side-by-side with Franklin and Edison." I assumed that the Russians had so classified me because I was not only an inventor but dwelt in the lands of capitalismdespite the fact that I am apolitical and an ardent advocate of an omnihumanity-advantaging freedom of individual initiative, and not of private enterprise's only selfishly benefited freedoms. In our second meeting, two years later at the Westchester Country Club, many of the American participants lived nearby and so went home each night. Together with the Johnson Foundation director I lived at the club with the Russians. I found that the young editor of Pravda was the only Russian amongst them who seemed free to explore and discuss spontaneously the world's future prospects. Though obviously a faithful communist, his speculative thoughts seemed not to be bound within popularly established party-line dogma. What I learned from the Russiansregarding which I am certain they were seriously convincedwas that "the U.S.S.R. would never be willing to negotiate with the U.S.A. regarding any world-around, supreme-power matters when the U.S.S.R. was in a weaker military position than the U.S.A."
They said to me, "Every time we struggle to attain parity with the U.S.A. so that we can negotiate, the U.S.A. institutes an arms advancement before the meeting, wherefore we are deprived of tolerable negotiating conditions. "Worse than that," they said, "this continually defeats turning our massive high-technology productivity toward realizing a life-style for our socialist economy equal to or better than that already enjoyed by capitalismwhose world-publicized high standard of living is a thorn in our side as we remain unable to do sonot because of technical or social inability but because of the preoccupation of technological resources with the cold warring." Assuming that an atomic war would mean that both sides would lose*ergo, it would not occurthe U.S.S.R. determined to outnumber and thus overpower the U.S.A. in the design and the production of conventional air and sea armaments and in the training and maintenance of a vastly greater standing army, whereafter they felt they could negotiate constructively for the establishment and maintenance of peaceful world-around conditions. It must be remembered that, in their 1920s-formulated, successive-multistaged five-year industrial planning, the Russians had assumed a World War II to occur in the early 1940s, at which time it would be evident to the private-enterprise world that socialism could be successfulwhich private enterprise had always said would be impossibleergo, the private-enterprise-dominated countries would start a war to destroy socialism but would do it in a highly deceptive manner by having a Nazi propaganda offensive launched against the German industrial cartels, which would suddenly be turned against the U.S.S.R. This is exactly what happened. The Germans first made the U.S.S.R. their ally. When well into Poland and at the Russian border, the Nazis turned treacherously against the U.S.S.R. The anti-U.S.S.R. strategy of the "Cliveden set" miscarried when, soon thereafter, the U.S.S.R. and the U.S.A. became allies. No one in the U.S.A. can understand the bitterness as yet existent in the U.S.S.R. over the millions of U.S.S.R. troops and civilians killed by the Nazis. The U.S.S.R. could not understand the U.S.A. rearming of the Germans, with whom the U.S.S.R. was much more concerned as a World War IV enemy than with the U.S.A. as such an enemy. The Russians had assumed in their five-year planning that when World War II terminated, they would be able to divert all their high industrial productivity toward advantaging all their people to prove that socialism could produce an economically desirable life-style equal to or better than that provided by capitalism. Again, the Russian planning became thwarted when Western capitalism, which had been socialized by FDR's New Deal, realized at the cessation of World War II that it could not carry on without the vast government procurement program which is occasioned only by war. To cope with this situation the capitalists invented World War III (which they called the cold war). The Russians queried of the U.S., their supposed ally, "Who are you going to fight?" and the U.S.A. answered, "You." This meant that the U.S.S.R. would have to focus all its high-science-and-technology productivity on producing armaments for decades of around-the-world cold warring, in the conduct of which both the Russians and the U.S.A. would have to avoid direct, all-out interconfrontation. With the joining of supreme-powers war by direct military confrontation, neither side could withdraw without all-out surrender. However, all-out intercontinental atomic war would mean the end of human life on Earth. Therefore, the U.S.A. and U.S.S.R., in testing their respective strengths, would have to operate indirectly against one another through their respective puppet nations, hopefully intent on drawing forth the "secret weapons" in the other's arsenals. Thus we have the North versus the South Koreans, the "Vietnamese" versus the Vietcong, the Israelis versus the Arabs, etc. The Russians decided early on that atomic warheads would not be used because the rocket delivery times traveling at 14,000 miles per hour were such that with radar traveling at 700,000,000 miles per hour, both sides would know ten minutes before being struck that the enemy had fired their atomic warheadsergo, both sides would have plenty of time to send off all their atomic warheads, and both sides would lose. So while deceptively continuing the atomic-warhead race with the U.S.A., the U.S.S.R. committed itself realistically to producing the strongest navy in history. The U.S.A. politicans kept the U.S.A. populace feeling militarily secure because they could point out that the U.S.A. was developing far more atomic warheads than was the U.S.S.R. The U.S.A. was doing so because big oil money, which successfully lobbied Washington's Capitol Hill energy policies-knowing that petroleum would ultimately be exhausted--fostered atomic-warhead production in order to build up the atomic technology industry (in the development of which the U.S. people's government had spent over $200 billion) and its nuclear scientist personnel whom they, the world-power-structure organizations, would need to employ in operating the atomic-energy plants and the electrical-distribution network as world petroleum supplies dwindled. They would need the energy meters in order to continue exploiting the capitalist world's energy needs. When Jane's Annual World Inventory of Ships showed that the U.S.S.R. Navy had reached parity with the U.S.A., the U.S. politicians laughed it off by saying the Russians did not even have aircraft carriers. This was true because the U.S.S.R. had seen that aircraft carriers are "highly vulnerable," so they built huge airplane-carrying submarines from which a plane would take off by "Vertol"vertical flight to height, followed by horizontal flightergo, needing no runways. This Vertol-from-submarine launching was strongly advocated by some of the U.S. Navy's most astute officers, whose word was not heeded because the aircraft carriers were much more profitable business for private enterprise. The weapons industry's Washington lobbyists were more persuasive than the U.S. Navy's experts. With its naval fleet supremacy established but lacking en route support bases, the U.S.S.R. then set about to develop disarmament talks with the U.S.A. from a superior conventional-warpower positionthat of controlling the high-seas lines of supply. Realizing that the U.S.A. senators had jurisdiction over all peace negotiating and that the U.S.A. Senate's Republican membership was intent to deprive the Democratic President of peace-making success, and that apparently the U.S.A. was not going to go along with ratification of the SALT treaty, the Russians decided to put the heat on the U.S.A. so that a global naval-line-of-supply confrontation incident such as the occupation of Afghanistan would demonstrateas it has in Iranthat the U.S.A. can no longer control the Indian Ocean and Arabian Sea and therefore cannot take yesteryears' sure-to-win military steps against Iran. The U.S.A.'s half-century dominance of world affairs is now terminating, just as did Great Britain's century and a third of dominance come to an end with the 1929 economic crash. Sir Halford Mackinder was Britain's chief geographical advisor from the latter Victorian period to 1930. Mackinder pointed out that the British Empire was built on its mastery of the world's sea routes from the Orient to Europe. He also pointed out to the British, circa 1900, that what the world's seacoasts might really be was not what one saw when looking at the world maps. He showed the British that the railways were the large-tonnage-capacity, previously seagoing, cargo carriers going up onto the land. He further showed them that the Trans-Siberian Railway was being built by the Russians to short-circuit the Orient-to-Europe high-tonnage cargo routes. Mackinder pointed out that the Trans-Siberian Railway was strategically too far to the north. Its snow impediment was too great to be economical. The British kept the Russians bottled up by refusing them an Atlantic portRussia had to go to Archangel in the Arctic Sea and, on the Pacific coast, to Vladivostok. The Orient Express ran only from Paris to Constantinople in Asia Minor. The czar-backing Russian-power-structure interests, hoping to compete with the British, represented the inheritors of the before-the-water-route, overland-caravaning powers of the Old World. Mackinder showed the British that the only economically successful trans-Europe and Asia railroad route would have to be from France to Constantinople and thence via Turkey and Iran to Kabul, Afghanistan, and thence through the Khyber Pass, through Sinkiang and Inner Mongolia to Shanghai, China, cutting shipping times down very much as compared with the sea routes around Africa to the Orient. Mackinder's counsel was heeded by the British. Mackinder showed the British that Russia could, by taking Afghanistan and Pakistan, reach the Persian Gulf and then come through the Indian Ocean to intercept British cargo ships en route to the Orient. Mackinder identified on the map what he called "the Heartland." The heart of Mackinder's Heartland was Afghanistan, with its Khyber Pass leading to the east and its ability to break through to the Arabian Sea and the Persian Gulf. Mackinder said, "Whoever controls the Heartland, rules the world." Afghanistan was (and as yet is) the heart of the world's heartland. After World War I the British were so "tired" that they did not listen to Mackinder as they had before. In the 1920s he tried to make the British realize that the airplane altogether eliminated the world's shorelines as the limit of travel. The British did not see the airplane as a cargo carrier and believed that their world trading exclusively by ships of the sea would not be threatened by air traffic. No one had ever flown across an ocean, let alone set up air-cargo fleets capable of competing with their seagoing fleets. One of the factors that they failed to envision was that of the technology becoming ever lighter per unit of functional performance until it became feasibly and economically air-deliverable. Mackinder developed a doctorate-level school in London in the 1920s. One of his students was a talented German named Haushofer, who listened to Mackinder pointing out that the armored tanks were, in effect, the navy destroyers coming out of the sea and running up on the land. Mackinder said to his students, "The French Maginot Line and all great fortresses around the world are obsolete." He continued, "The airplane raiders above and the armored tanks on the land could circumvent, overrun, and overfly the fortresses and overwhelm any troops or other defense." Haushofer graduated from Mackinder's school, returned to Germany, and went to work for Goering, Hitler's air minister. Haushofer described Mackinder's science in German as Geopolitik. From his description of Mackinder's concept, which the British were not heeding, Goering developed his blitzkrieglightning warwith the Luftwaffe commanding the sky and tanks and other armored vehicles commanding the land. Goering flew over and rolled over the Maginot Line and took all Europe. Until the end of World War II the British had kept the Afghanistan heartland well under control. Then, after World War II, they let its militarily guaranteed isolation greatly deteriorate. Meanwhile the Russians were busy giving Afghanistan such "presents" as a first-class highway from Russia to Kabul. The U.S.A. gave them naught. In 1954 the British Foreign Office advised the U.S. State Department that they had just learned from their ambassador in Kabul, Afghanistan, that Russia, East Germany, Czechoslovakia, and China had all installed impressive exhibition buildings in Kabul to take part in Afghanistan's most sacredly important holidaythe Geshin Fair. Neither the United Kingdom nor the U.S.A. nor any of their allies had an exhibit in Kabul. I received an emergency call from Jack Masey of the U.S. State Department's U.S. Information Agency. He asked me how long it would take me to produce a 10,000-square-foot-floor area geodesic dome so light and compactly shippable that it could be sent by one DC-4 airplane to Kabul. My Raleigh, North Carolina, shop had it produced in twenty-five days, complete with a high-tension, all-weather skin outwardly tensed to its geodesic, tubular aluminum frame. All the struts and hubs of the dome were color-coded. The 114-feet-in-diameter dome was test-assembled at the Raleigh airport and accepted by the U.S.A. It was flown to Kabul with my one engineering representative to supervise its erection by the Afghans. It was assembled in one day just in time for the Geshin Fair opening. The U.S.A. show inside consisted of the Borden's "laughing cow," bouncing ball bearings, and Lionel trains. No one showed interest in the show inside, but all the Afghans, the Russians and East Germans, the Chinese and Czechs, were fascinated with the geodesic dome itself. The Russians asked permission to bring in their moving picture equipment to make a documentary of the dome construction. The then king of Afghanistan fell in love with the domeit was a great modern-materials Afghan yurtthe Afghans' own architecture. The king asked the U.S.A. to give him the dome, but the U.S.A. refused and sent the dome off as an around-the-world traveling show. The Russians, finding the Afghans making themselves working automobiles out of the most battered second-hand cars shipped into Kabul and then driving them around on very rough dirt roads, made the Afghans a present of macadam-surfaced, first-class roads, which delighted the Afghans because they provided some real distance drivingthe Russians extended the highways all the way into the U.S.S.R. These roads recently (1979) provided the means for the U.S.S.R. to roll their armed forces into Afghanistan. Having been a long-time student of Sir Halford Mackinder's work, I was fascinated through my dome experience to discover that the U.S. diplomacy apparently knew nothing of Mackinder's "Heartland" conceptor considered it to be no longer relevant. When early in 1979 the U.S.S.R. took over Kabul, Afghanistan, it was because the balance of world power had shifted from U.S.A. to U.S.S.R. mastery. As we have related, Mackinder had identified "The Heartland" on the maps. The heart of his Heartland was Kabul, Afghanistan. Also, the Russians with their now-great navy had access to the Atlantic Ocean only at Archangel and the Baltic ports and Vladivostok in the North Pacific. With Afghanistan under their control the Russians were able to control all the northern and eastern borders of Iran and the western borders of Pakistan. Russia always uses the power structure's number-one strategy"divide to conquer! "and does so with psychological expertise. She often finds religious divisibility the most propitious. It was feasible in Iran, which could be divided religiously against the incumbent political powerergo, the Muslims versus the Shahdom of Iranwith knowledge that after driving out the U.S.A.-supported Shahdom, it (the U.S.S.R.) could divide the Muslims into their subsects and militarily overwhelm Iran. The U.S.A.'s secretly supported Kurdish opposition to Russia in Afghanistan and to the Muslims in Iran would become the final obstacles to the Russians' century-held objective of gaining direct access to the Indian Ocean and therewith complete control of U.S.A. access to Arabian oil. The Russians' move into Afghanistan was not just a power-structure play. They were exercising their evolutionary ascendancy into the world's top power position. The HeartlandAfghanistan and its ultimate access to the Indian Oceanis the historic prizes of the world's top power position. Fortunately for the cross-breeding world citizens of North America and for the rest of the world, the U.S.S.R. is most probably intent on getting the world power structure under irreversible control as quickly as possible so that it can institute controlled demilitarization and thereby turn its immense productivity toward improving the standard of living for the socialist world and thus prove socialism's life-style to be equal to or better than the best of the life-styles produced by capitalism. I am confident that Russia does truly intend world disarmament. She will keep a powerful upper hand at each stage of disarmament but will seek to have the world's militarily scrapped metals reinvested in peacefully productive livingry advantage for all the world's peoples. I have only one objection to the concept of comprehensive socialism: So far it has made no provision for effective development of the individual initiative of humans. Too long has such freedom of initiative been usurped either by the Communist party, representing only 1 percent of the U.S.S.R. population, or by the Western world's private enterprise's utterly selfish exploitation for money-making rather than for common sense-making. I have discussed this point with the Russians. They admit that a party dictatorship is not "democracy" and, at the same time, also admit that it is for true democracy to which the Russians, the Chinese, and most people of the world aspire. Possibly the electronically operative democracy and its ability to cope with complex problem-solving will also make safe the realization of individual initiative to be exercised on behalf of all humanity by any humans anywhere. *See p. 117, "Legally Piggily" chapter, and page 192 of this chapter. We next observe the great twentieth-century influx of industry onto the California coast. Overnight settlements became towns and towns became cities, each with its own chamber of commerce doing its best to attract ever more industry. In order to pay for town governments taxes are necessary. In order to pay political obligations the elected town administrations need money to hire people to carry on all the legislatively conceived taskssome of them necessary, many of them unnecessary, but all requiring large sums of money. The Los Angeles Chamber of Commerce and the Los Angeles government did everything they could to invite industry to move into their domain because industries produce the greatest amount of taxable money-making. Industries also produce jobs and thereby in turn wages that can be taxed. Los Angeles did everything it could to attract industries and businesses. Having many locally occurring petroleum wells, one of the most logical of industries brought into Los Angeles was that of oil drilling, pumping, refining, storage, and shipping, such as those of the concentrated operations of the oil fields and harbor area of Los Angeles's Long Beach. Los Angeles built a vast number of huge refineries in the southwest part of the city. On its southeastern side Los Angeles positioned its steel mills to satisfy the large demand for steel products in the building of the oil refineries, their storage tanks and pipelines. The fumes from these industries then loaded the mist and the warm airs, and the Sun-exposed upper cloud surfaces and their shaded lower surfaces produced temperature differentials, which in turn produced layer inversion, with the fumes locked in on the underside, which then acted as a widespread lower atmospheric lid, holding the industrial gases and fumes close to the ground throughout the whole Los Angeles basin. Thus smog became an industrially produced phenomenon. Los Angeles's citizens became politically articulate about this "air pollution" and went to their city government saying, "We mustn't have this in our city." The city government then went to the utilities, refineries, and steel manufacturers and said, "Stop putting your smog-producing fumes into our sky. We've looked into the situation and find there exists equipment that makes it possible to precipitate that fume. But you don't have that equipment." The companies responded, "If we put in that fume-precipitation equipment, it will cost us so much more to produce here in L.A. than it does companies producing in places that don't have such controls that we won't be able to compete in our industry. We'll be forced out of business. So we're either going to have to cut out this nonsense about fume precipitation or move out of your city." The municipal government said, "For Heaven's sake, don't leave. Your tax base is essential to our political survival. We're politicians, we'll fix it up in some other way." Soon thereafter the L.A. city government made the following pronouncement: "People, the smog is your fault. It's your backyard incinerators that are producing this smog." The people said, "Sure enough, we are incinerating in Los Angeles. We are in the wrong. We must stop incinerating." So a law was passed saying that nobody could incinerate within the city limits. The people did stop incinerating, and the smog abated--but only in minor degree. The real offender was the industrial fumes. Along came World War II, and the issue was buried under more immediately pressing matters. When World War II was over, great numbers of additional citizens moved into California. Suddenly the smog problem was back, and the whole act of pre-World War II was repeated. The people complained to the municipal government, and the omnichanged government personnel had entirely forgotten about what had happened twenty years earlier. They went after the big corporations, which threatened to leave town, and the city once again pleaded, "Don't leave town. We need you here." Once more the city blamed the people: "It's the fumes from your automobiles that are producing the smog. We have taken samples, with scientific instruments, of the below-the-smog air, which samples when analyzed proved the obnoxious fumes to be those of your automobiles." With their greatest election-fund support coming from the oil men, and with the most powerful regulation lobbying being carried on also by the oil men, the politicians of America took up the cry, "It's the automobiles." The people said, "Why, sure enough. We'll have to do something about it. We'll pass laws to limit the level of fumes coming out of each car and require the manufacturers to produce and install special smog-control equipment in each car." The automobile companies loved that. It meant more accessories to be manufactured and sold and an obvious way to rationalize increasing the price of their cars. Christmas and New Year's Days are celebrated everywhere in America, but Los Angeles, being a relatively new and gigantic social body, is able to alter its celebration customs. The L.A. refineries and heavy industries have learned that the people of California want to take a Christmas vacation. So the holiday becomes a ten-or-more-day vacation starting the weekend before Christmas and continuing through the weekend after New Year's Day. It pays all the refineries and other heavy industries to shut down their plants. As the holiday proceeds, the air gets clearer and clearer, until on New Year's Day--the traditional Rose Bowl Dayyou find throughout Los Angeles a dreamy-clear view of all the surrounding, often snow-capped mountains. If you went out with scientific devices to measure the fume-level from the cars, your instrument would read approximately zero. The only reason that auto fumes were previously measurable was that the industrial-fume-laden ceiling held the auto fumes down and locked them in at the level at which you and I are breathing. I have taken many New Year's Day pictures from the hills of Los Angeles showing it to be absolutely clear. Then, on back-to-work industrial Monday, you see a vast, molasses-brown cloud rolling in from the southwest gradually to obscure the whole of Los Angeles. There is no question about it. It is the refineries, the steel and other mills, and the public utility fumes that produce the smog. But no municipal government anywhere in America is going to let its industry go away. Therefore, cities are always going to find political ways of absolving the industries while blaming the people. Air does not stay in any one place. There is a preposterously stubborn myth about "this being my or someone else's airspace.... This is my air." Air keeps moving right through the geometry of our environment to continually recircle the Earth. The air belongs only to everybody on our planet.